When purchasing metal garages, Missouri residents who buy with us can choose from many different sizes and styles of 1-car garages, 2-car garages, or even metal 3-car garages. In MO, we offer a wide range of customization options, and on top of that, all orders of metal garages in Missouri are delivered and set up for free! Whether you’re shopping for metal buildings in Kansas City, St. Louis, or Poplar Bluff, we have the best steel building kits for sale to meet your needs, thanks to our wide variety of custom options. 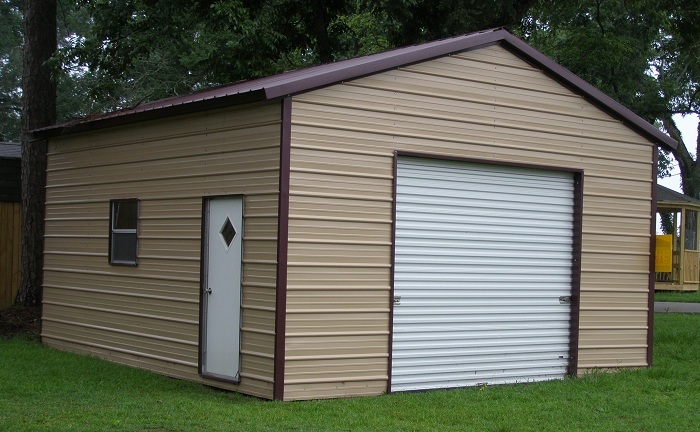 Choose small Missouri steel buildings in a style that matches your house, or buy a vast metal garage to house heavy equipment. Opt for a regular roof, or choose vertical-style so the snow slides right off in the winter. It’s up to you! Once you’ve chosen and customized your metal buildings, Missouri orders will be sent to your property promptly, along with an installation crew to provide professional setup. We have a wide service area, so whether you order steel buildings in Kansas City, Springfield, Independence, Columbia, Jefferson City, or Lee’s Summit, we’ll be there to set them up for you. 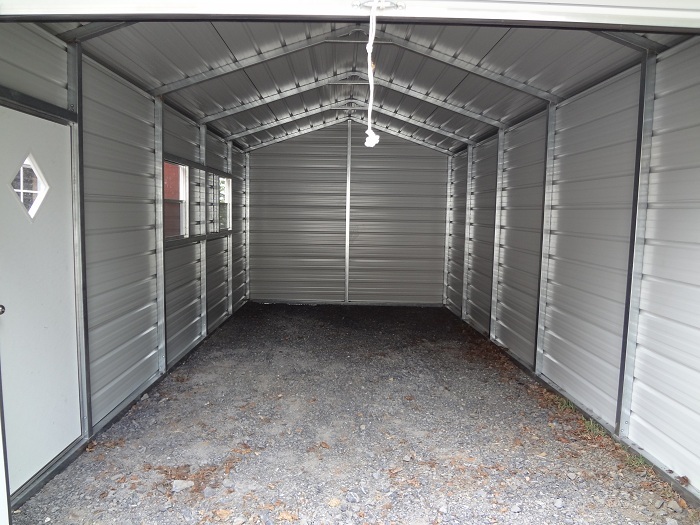 Our steel garages in Missouri are built with 14-gauge tubing and 29-gauge sheeting. Optional thicker 12-gauge tubing is available as an option when you buy metal buildings in Missouri, and this comes with a 20-year rust-through warranty. 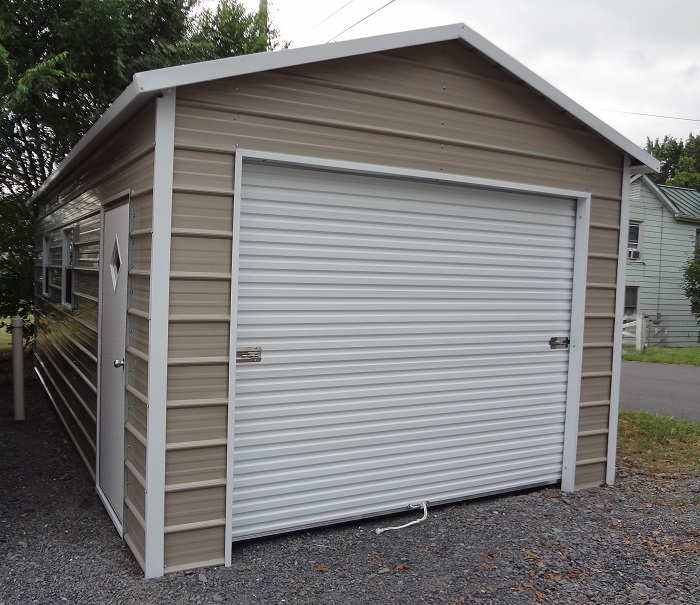 Each of our metal garages in MO can be anchored to the ground for free with rebar or to your concrete pad with concrete anchor bolts; mobile home anchors are also available. And our steel buildings come standard with center braces, but fully braced construction is also an option. Certified Missouri metal garages are also an option. What “certified” means is that blueprint drawings are faxed to your local building inspector; some locations require blueprint drawings, and others don’t. A certified metal garage is rated for 130 mph wind and 30 psf snow load. The certified package for steel building kits for sale also makes your garage fully braced and comes with mobile home anchors or additional concrete anchor bolts to give it the 130 mph wind rating. When a metal garage is certified, additional tubing will also be added to the front and back ends. If you don’t need a fully enclosed metal garage, Missouri steel buildings may not be the best choice, but thankfully, we also have sturdy metal carports, which are also delivered and set up for free. You can also get a carport that’s partially enclosed for a happy medium between a regular carport and a garage. The prices of our buildings will vary greatly depending on the dimensions, with costs ranging between $7,295 and $138,460 for sizes between 4 by 20 feet and 60 by 300 feet. We work hard to make our prices as affordable as possible, though some market factors may be beyond our control. When you’re ready to buy a metal garage in Missouri, make the right choice: Choose Alan’s Factory Outlet!